I have to admit – much as I am in favor of drip irrigation systems – I didn’t, exactly… well, in any way… get mine in this year. So I am watering by hand, which can be either tedious or fun depending on the day, and is made much more interesting by the wasp nest affixed to the hose holder (the hose is coiled on the ground at the moment). I do try to water in the mornings to limit the possibility of fungal disease, to focus the spray as much as possible at the roots and not on the leaves, and to give each plant the time it deserves so the water penetrates deeply. And hand-watering does have the advantage of forcing you to spend time in your garden observing plants. The tomatillo cage had fallen over and was leaning on some tomatoes that are already stressed and don’t need a thug (I’m sorry, but that’s what tomatillos are) invading their territory more than it already is. Needed to be braced up in several directions. A whole bunch of tomato branches needed tying up. Or tieing up, as Bob advises. A Charentais melon was big enough to require supporting. 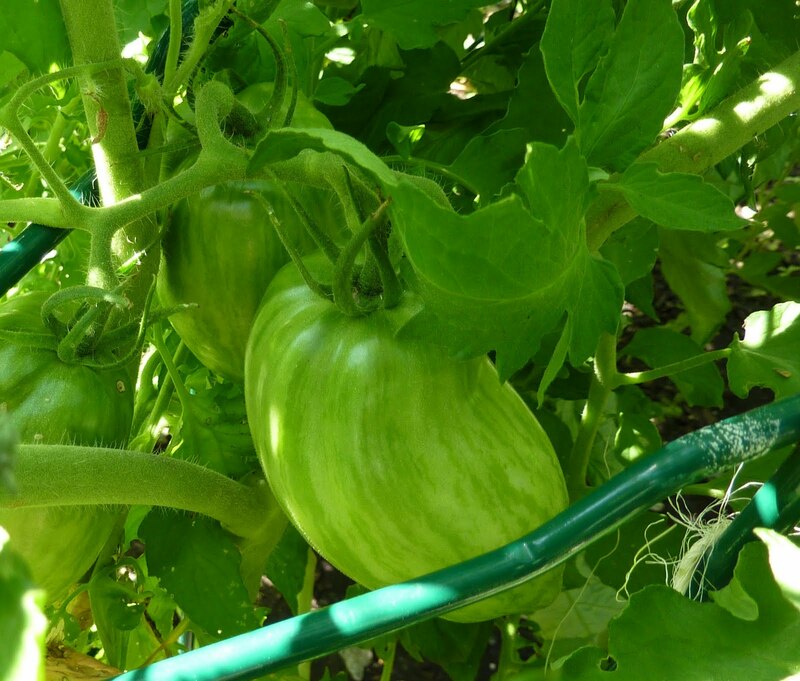 Here’s a good explanation of how to do it, from a demo garden blog in Kansas. I used a net bag instead of pantyhose. A zucchini that looks fine and healthy nevertheless has tell-tale frass at the stem base. Looks like a squash borer. Not sure I got it, alas. Another zucchini is obviously stressed, but no signs of a borer. It’s in a large pot – appears to have plenty of water, but perhaps just the confined roots and extra heat are getting to it. Nothing to be done except keep the moisture levels even. The compost volunteer peppers needed staking. Still no clue what kind they are. More mouse melons to harvest, oh dear. Like I should complain. Time to pickle! So, whether it’s for watering, harvesting, or just walking around, get out in your gardens! You never know what you’ll see.